“But at that time shall Michael rise up, the great prince, who standeth for the children of thy people: and a time shall come such as never was from the time that nations began even until that time. And at that time shall thy people be saved, every one that shall be found written in the book” (Dan 12,1). His name “Mi ka – ‘El” means “Who is like to God!”. Saint Michael has the title of Archangel attributed to Him, the same title given to Gabriel (God’s strength) and Raphael (God heals). “And there was a battle in heaven; Michael and His angels battled with the dragon, and the dragon and his angels fought back. And they did non prevail neither was their place found any more in heaven. And that great dragon was cast down, the ancient serpent he who is called the devil and Satan, who leads astray the whole world; and he was cast down to the earth and with him his angels were cast down. And I heard a loud voice in heaven saying. 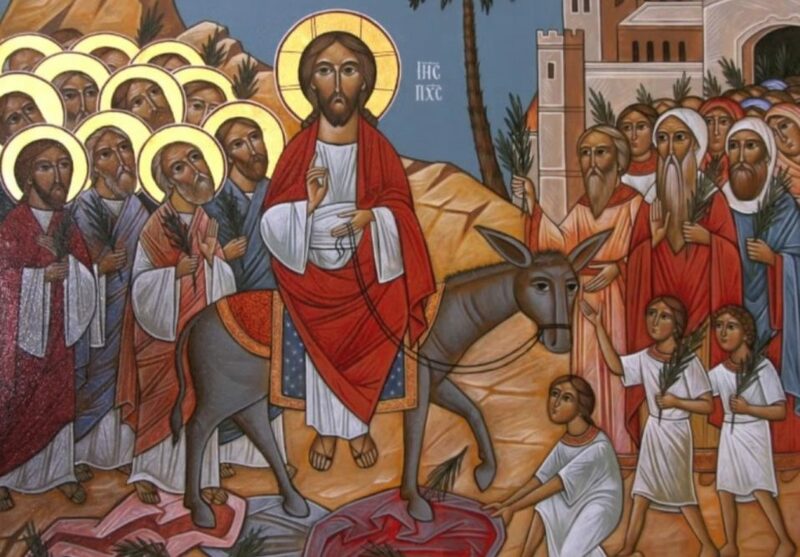 Now has come the salvation, and the kingdom of our God, and the authority of his Christ for the accuser of our brethren has been cast down, he who accused them before our God day and night. And they overcame him through the blood of the Lamb and through the word of their witness, for they did not love their lives even in face of death. Therefore rejoice, oh heavens, and you who dwell therein. Woe to the earth and to the sea because the devil has gone down to you in great wrath, knowing that he has but a short time.” (Rev 12, 7-12). Therefore Christians consider the Archangel Saint Michael as the most powerful defender of God’s people. In eastern and western iconography, St. Michael is represented as a warrior, with a sword or a lance in his hand and, under his feet the dragon, monster, Satan defeated in battle. From centuries believers have entrusted themselves to His protection here on earth, but also in a particular way at the moment of judgment, according to an ancient invocation: “Saint Michael, defend us in the day of the battle, lest we perish on the day of judgement”. The Archangel is also acknowledged to be the guide of souls to Heaven. This role of St. Michael is underlined in the Roman liturgy, particularly at the Offertory of the Mass for the dead: “O Lord Jesus Christ King of glory deliver the souls of all the faithful departed from the pains of hell; but may the holy standard-bearer Saint Michael, lead them to the holy light; which you promised to Abraham and to his seed of old”. Tradition also gives St. Michael the task of the weighing the souls after death. That is why he is sometimes represented holding a pair of scales as well as a sword. 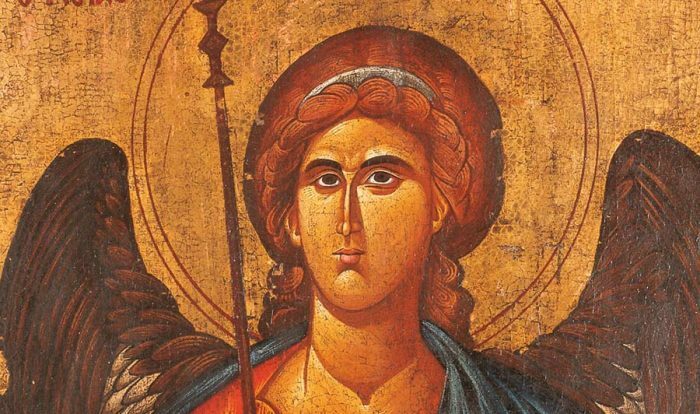 Moreover, in the first centuries of Christianity, especially amongst the Byzantines, St. Michael was considered a heavenly doctor of men’s infirmities. He was often identified with the Angel of the pool of Bethesda whom the Chapter 5 of the Gospel of St. John says: “Now there is at Jerusalem, by the Sheep Gate, a pool called in Hebrew Bethesda, having five porticoes. In these were lying a great multitude of the sick, blind, lame and those with shrivelled limbs, waiting for the moving of the water. For an angel of the Lord used to come down at certain times into the pool, and the water was troubled. And the first to go down into the pool after the troubling of the water was cured of whatever infirmity he had” (St. John 5,2-4). The AKATISTO, which is a hymn of the Byzantine liturgy dedicated to the Archangel Saint Michael, sings in this way: “You not only defeated the great and horrible dragon in the shrine of Chone but a water course formed that heals all the infirmities of the body”. Finally, St. Michael has the unusual privilege of assisting at the throne of the Divine Majesty. He presented himself like this to Bishop Lawrence: “I am Michael and I am always in the presence of God…”. 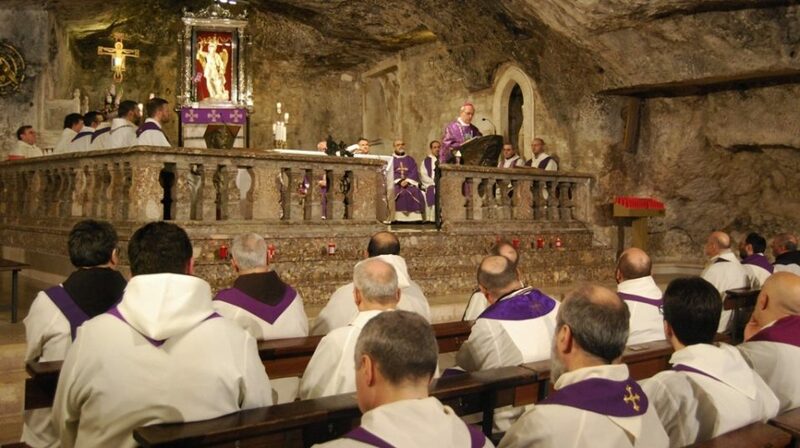 And the liturgy of the Council of Trento whilst offering incense, prayed in the following way: “Through the intercession of St. Michael the Archangel who is at the right-hand of the altar of incense… deign to accept and bless this offering of incense…”. Today the Church celebrates St. Michael’s Day together with St. Gabriel and St. Raphael, on September 29th. In the past there were two liturgical feast-days in honour of the Archangel (that are still celebrated in the town of Monte Sant’Angelo): on September 29th, a feast-day that was first celebrated only in Rome, as a remembrance of the dedication of an old Basilica erected in his honour on the Via Salaria; the other on May 8th, anniversary of the apparition of St. Michael to the Bishop of Siponto on the Gargano and in a special way to celebrate the victory of the Sipontini army against the invaders (2nd Apparition). September 29th: dedication of the Basilica. Pope Pious V (1566-1572) instituted the feast-day of the apparition of St. Michael on 8th May. A lot of churches, chapels and oratories were dedicated to St. Michael in the whole of Europe. The Archangel is often represented on the spires of bell-towers, because He is considered the guardian of churches against Satan. Furthermore lots of the ossuary chapels in cemeteries are dedicated to him. 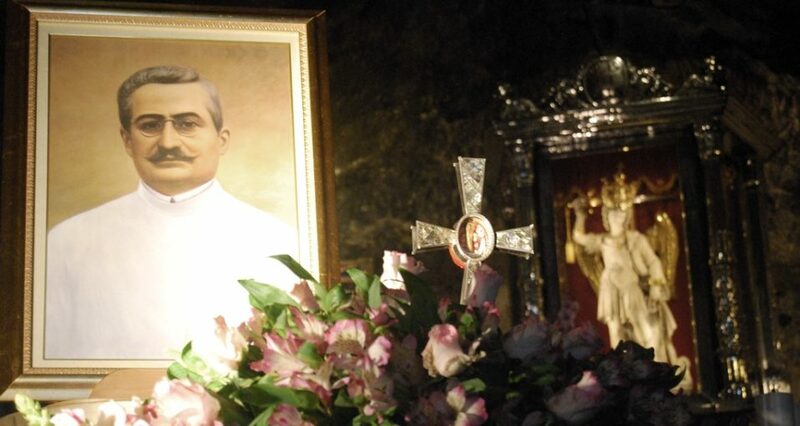 Many cities in Europe (Jena, Andemach, Colmar) venerate Him as their patron saint; in Italy we find more than 60 localities under His protection (Caserta, Cuneo, Alghero, Albenga, Vasto…). Some nations entrusted themselves to Him, such as the Longobards and sovereigns, such as Charles Anjou, great protector of the Gargano Shrine and the sovereigns of the Valois dynasty. St. Michael is also the protector of many categories of workers: chemists, gilders, merchants, manufacturers of scales, judges, fencing instructors, radiologists. The police and the parachutists of France and Italy have entrusted themselves to His protection. 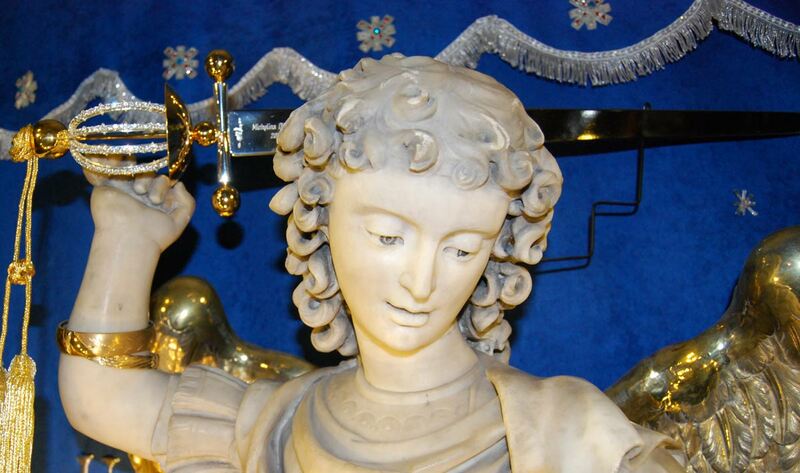 Finally, we would like to remind visitors and pilgrims that the religious family who are at present the guardians of the Shrine on the Gargano belong precisely to the Congregation of St. Michael the Archangel.